Increased blood circulation helps remove toxins and micro pollutants from the hair cell matrix. (A must for those with thinning hair). Great styling brush and detangler, can be used on wet or dry hair. Adds volume to your hair and reduces breakages. Use two minutes daily to increase blood circulation to the scalp maximizing the flow of oxygen and nutrients to the hair follicle. Use brush to give a gentle massage to the scalp area. Leads to a healthy scalp and hair. Promotes youthful, healthy, fast growing hair. 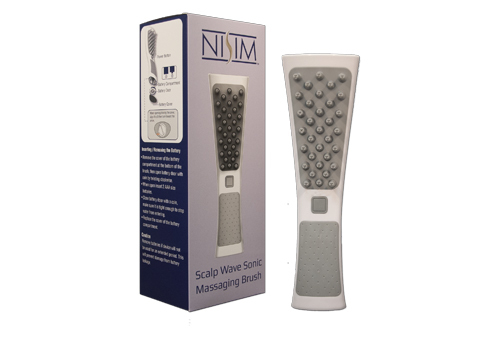 Vibrating soft rubber bristle, contours to your scalp. Streamline design with anti-slip grip. Portable for traveling and home use.